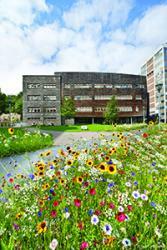 The area in front of the Environment Centre Wales building is sown with wild flowers. : copyright Iwan Williams.Bangor University has been placed 22nd in a global league table of the world’s greenest universities. 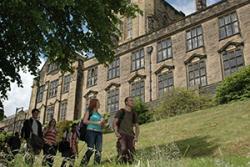 Bangor University has risen 6 places in the latest table, which now, for the first time includes over 400 universities worldwide. The University is also placed fifth in the world for its campus setting and infrastructure. This is one of the 11 indicators in the table and reflects the university’s environmental policies and whether the University can be truly described as a green environment. College Park“This latest news demonstrates that we are continuing to make significant progress in the management of our environment, not only at home but globally. We are reducing our energy use and carbon footprint annually, and we are now recycling more waste than ever as we continue to maintain our Green Dragon and ISO14001 environmental certifications. This league table is a testament to our wider commitment to a sustainable Wales, a sustainable UK and a sustainable world”.